You are currently browsing the tag archive for the ‘composting’ tag. Last fall, I had the great idea of using mulched leaves from our yard to cover my back garden, with sits in partial shade between two large maple trees, for the winter. I knew I would be using this plot early this season for our peas, and I wanted to inhibit the weeds and keep the ground moist and easy to work. This spring I got a later start than I had planned, but now my pea garden is well underway. I have two of my four rows planted, and a third ready to plant. The surprise, when I pulled off the leaves and moved them to my side garden to smother out the dandelions that were surfacing there, was that my pea garden is filled with worms — the good composting worms: red wigglers to fishermen, Eisenia fetida to biologists. I’m not talking a few worms here and there. I’m saying that with every single shovel-full of dirt, there are a good dozen or more of these lovely composting angels, turning all of those leaves into vermicast (otherwise known as worm manure), all waiting there to feed my peas for the coming season. Beautiful red wigglers that I will put to work in my compost bin. 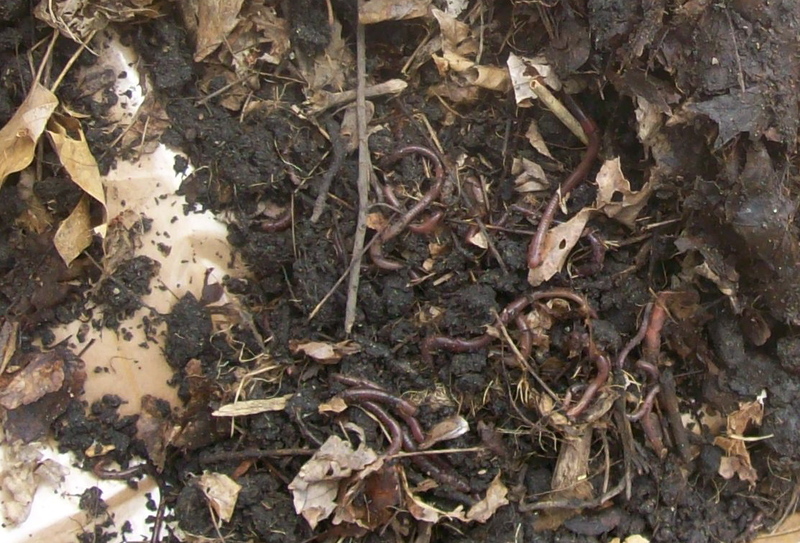 Of course, I have gathered up the worms that I could catch for my own compost bin. They will continue to feed off of last fall’s leaves, as well as banana and potato peels and other kitchen waste, converting it to organic matter that will fertilize my garden for the coming season.